Two handles approximately 1" wide, 24" long, should drop of 13"
If you go to the gym and then straight to errands or work, then you need a good gym bag. It's so hard to find one that's not too bulky or masculine! Well, ladies, we have just the bag for you. 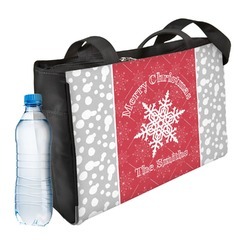 Look stylish with a custom gym bag when you go to the gym. This great gym back is made of a sleek fabric that has a gorgeous sheen to it. If you want to catch some eyes in the gym, taking this high class bag will certainly do it. There are outer pockets that are perfect for storing a waterbottle or two. The two straps are the perfect thing for carrying over your shoulder. Inside there is a divider to keep your clean clothes separate from your sweaty gym clothes. There is a zip pocket inside along with a key fob to keep your keys on. The four metal feet on the bottom will keep your bag standing upright on the ground. The straps drop about 13" off the shoulder and the body of the bag is about 15"W x 11"H x 5"D. It's practical and fantastic quality. Why pass it up? 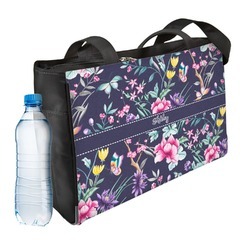 Go into our design center to start designing the perfect thing to go on your gym bag. Find something cute or sassy to get people to notice. Create something that just spills over with personality. If you need any help getting started just ask. We are always happy to help. If you're looking for the perfect workout, we can help with that! Check out our Sports and Activities section where you'll find everything you need for a good workout. 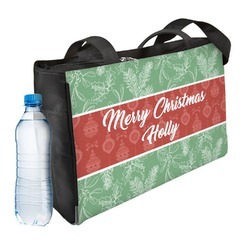 There are waterbottles, sports towels, tapered waterbottles, yoga mats, golf tee sets, and more. Make sure you also check out our custom leggings and racerback tanks as well!